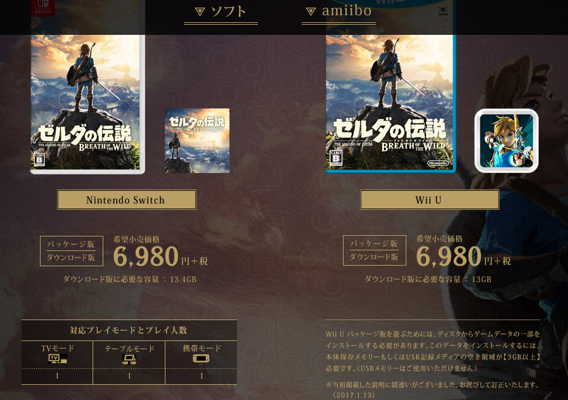 According to the Nintendo Japan page for Breath of the Wild, the game comes in a 13.4GB on the Nintendo Switch and 13GB on the Nintendo Wii U. With the Nintendo Switch only having 32GB of space - less when you take out system file storage - this is a large part of the internal storage. The Wii U only had 32GB of space for the larger storage configuration as well. So for those who prefer digital, you will want to find an external solution because the internal storage will become filled quickly after a few games. Breath of the Wild launches on March 3rd, 2017 for both the Nintendo Switch and Wii U!